Dahl is a thick stew made with lentils, it is often made with ghee but this version is vegan. It is incredibly simple, satisfying, and good for you! I love all the spices that are traditionally used: paprika, mustard, coriander, turmeric, cinnamon, and cumin. Such warm combinations. 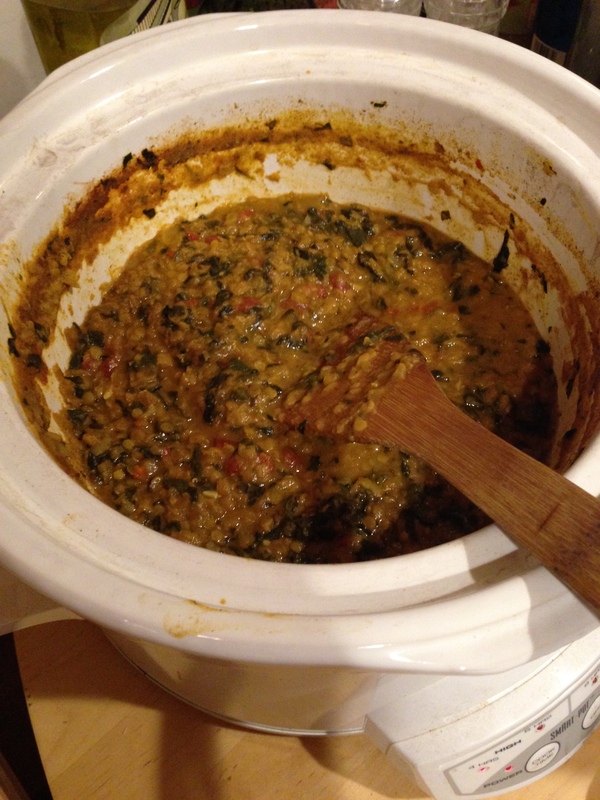 This is my take on a red lentil dahl made in a crockpot. I added coconut milk because I love the flavor and texture so much! Saute a few ingredients in the morning and throw the rest of the ingredients in the pot. Then you get to come home to a delicious smelling dinner, this crock-pot cooking is pretty sweet! We serve this traditionally with basmati rice, if you can find roti it is also a delicious combination. 1 small hot pepper of your choice – I used a wonderful pepper that my niece brought me a few weeks ago from her family garden, it was delicious and added some heat! Add frozen spinach – I didn’t even chop it!